Bishop Christopher has announced that the Ven Trevor Reader, Archdeacon of Portsdown, is to retire with effect from January 2013. Dr Reader, 66, has previously served as Archdeacon of the Isle of Wight and as a parish priest in the Anglican diocese of Portsmouth since 1986. His final service as Archdeacon will be on Christmas Day, and there will be a farewell service in Portsmouth Cathedral at 6pm on Sunday 9 December. He has been Archdeacon of Portsdown since 2006, one of three Archdeacons in the Portsmouth diocese. The post involves supporting Church of England clergy in parishes in Portsmouth and Havant, offering Christian leadership on behalf of the bishop and helping the bishop to plan strategically and implement God’s vision for the diocese. 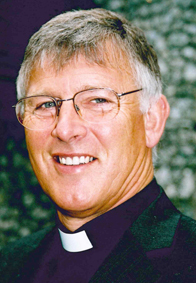 He had previously been Archdeacon of the Isle of Wight from 2003-06, fulfilling a similar role across the island. Before that he worked as a parish priest in Blendworth, Chalton and Idsworth and diocesan director for non-stipendiary (unpaid) ministry from 1998-2003, and at St Mary’s, Hook-with-Warsash, from 1989-98. Dr Reader also chaired our diocese’s Board of Education, which advises and supports 47 Church of England schools, from 2003-09. Trevor was born in Wales, but originally came to Portsmouth to study at the polytechnic. After securing a zoology degree and a PhD in parasitic diseases, he continued as a lecturer and research worker there for 14 years. He wasn’t originally a churchgoer, but started attending family services with his young family and decided Christianity helped him to make sense of the scientific world he was studying. He then felt called to the priesthood and started training for ordination in 1983 on a course based in Salisbury. He worked as a curate at St Mary's, Alverstoke, in Gosport, for two-and-a-half years before taking charge of his first parish at St Mary's, Hook-with-Warsash. He is married to Lynne, and has six daughters and eight grandchildren.